Refresh, rehydrate and rebalance skin with Oxygen Mask. Oxygen Mask not only moisturizes skin but aiding in revive lack luster skin. Formulated with “Bohr O2 Fluid” technology, this special “liquid ventilation” system stabilizes oxygen molecules and releases oxygen onto your skin’s surface to create an oxygen enriched layer within the skin. 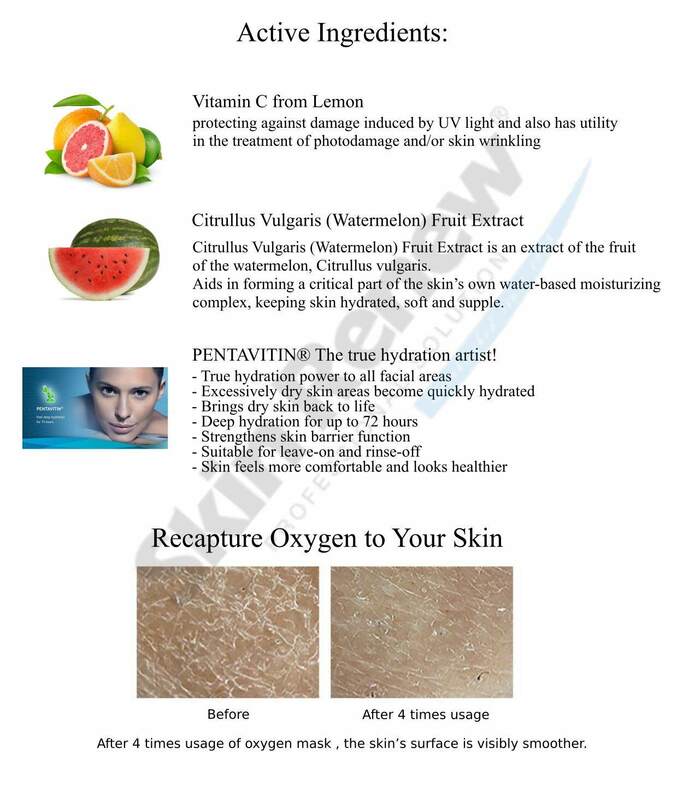 The skin will be saturate with oxygen which will then activates the cellular regenerative system of the skin which depletes with age and promotes wound healing process to facilitate the regeneration of healthy looking skin. When cells are under the high level of oxygen, unwanted toxics from the cell are able to discrete from the body by diffusion and this aiding to cure acne existing acne and prevent further breakout. Another great benefit is the use of Sodium PCA, a molecule that keeps your skin hydrated without making it oily. Lemon, which is one of the most potent forms of vitamin C, ensures your skin is getting the nutrition it needs. Apply oxygen mask onto the cleaned face。Leave for about 20 minutes.